We call these Cinnamonies around our house. 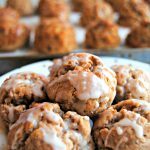 Gluten-free Cinnamon Biscuit Balls are a quick and easy special breakfast treat. With a dairy-free option. One of the things my husband misses the most since going gluten-free is biscuits. My husband is from the South and biscuits are eaten at breakfast, lunch, and dinner. One of my husband’s favorite breakfast biscuits is Hardee’s cinnamon raisin biscuits. Years ago, I found Martha White’s gluten-free buttermilk biscuit mix at Walmart. This mix made really good drop biscuits. I then thought about using the mix to make cinnamon biscuits and that’s how cinnamonies were born. My Walmart is no longer carrying the Martha White’s gluten-free buttermilk biscuit mix, so I came up with a new recipe for the gluten-free buttermilk biscuits. Gluten-free cinnamon biscuit balls are one of my family’s favorite breakfasts. They are super easy to make and they taste as good as they look. 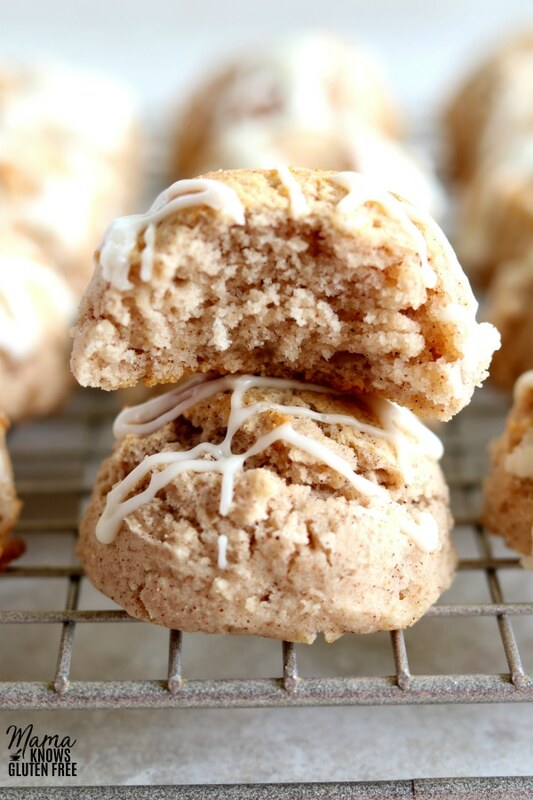 If you want a traditional cinnamon biscuit, try my Gluten-Free Cinnamon Biscuits! Check out my other Gluten-Free Breakfast Recipes. We call these Cinnamonies around our house. 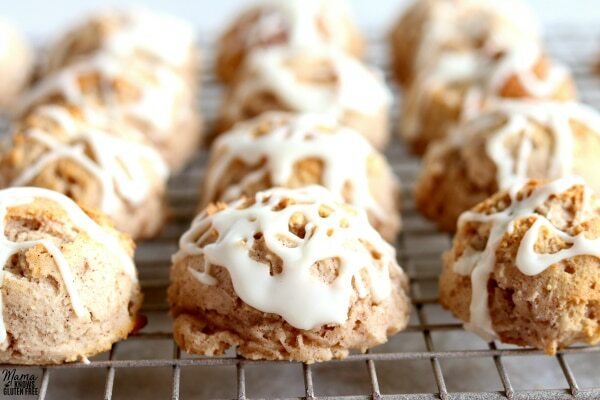 Gluten-Free Cinnamon Biscuit Balls are a quick and easy special breakfast treat. 1 cup buttermilk dairy-free use cashew, almond or coconut milk. Make your own buttermilk by adding 1 tablespoon of white vinegar or lemon juice to the cup of milk and let stand 5-10 minutes. In a large bowl add the gluten-free flour, baking powder, salt, sugar, and cinnamon and give it a quick whisk or stir to combine the ingredients. Cut in butter (or shortening for dairy-free) into the flour with a pastry cutter or fork until it looks like the size of small peas. Stir in the buttermilk. To make your own buttermilk by adding 1 tablespoon of white vinegar or lemon juice to the cup of milk and let stand 5-10 minutes in the refrigerator to stay cold. Add the whisked egg and stir until a soft dough forms. The dough will be sticky. Use parchment paper or gluten-free cooking spray on cookie sheet. Use either a cookie scoop or tablespoon to scoop out a ball of dough. Roll the dough into 1 inch balls. 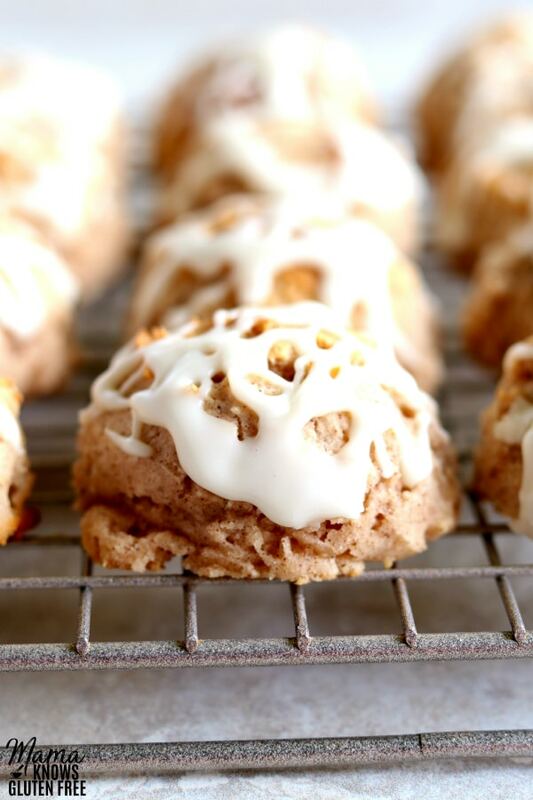 Drizzle icing over cinnamon biscuit balls. Version #1 recipe adapted from Betty Crocker. I was wondering if you think substituting a flax egg for the regular egg would work? I’m finding biscuits also difficult to make since I can’t have eggs! Hi Rene! I have never made them with a flax egg, so I’m not sure how they will turn out. If you try it will you please let me know how they turn out? Thanks! How long do these stay fresh? If I made them on a sunday would they still be good on thursday? Hi! I’m not sure because we never have leftovers. It’s always best with gluten-free baking to make them the same day. I hope you enjoy them!